By Colette Wabnitz, Michelle Taylor, Edmund Green and Tries Razak. UNEP World Conservation Monitoring Centre. 219 Huntington Rd. Cambridge, CB3 0DL. UK. 2003. This report contains 65 pages, illustrated with informative tables and graphs and with photographs of targeted species and collection techniques. The World Conservation Monitoring Center (I’ll use US instead of the British spelling) of the United Nations Environmental Program has released a new report on the international trade in marine ornamental species. This report follows a number of highly critical official documents I have reviewed on the trade that brings us the great majority of our specimens. As far back as the August 1999 issue of Aquarium Frontiers, I presented material from Hawai’i’s State of the Reefs Report, 1998 by Athline Clark and Dave Gulko. That report stated that there has been a substantial decline in aquarium targeted species – 43 percent in Yellow tangs, 54 percent in Longnose butterflyfish, 48 percent in Potter’s angelfish, 63 percent in Achilles tangs and 36 percent in Moorish idols – compared with fish populations in sites that are protected. Evidence indicated that collection for the aquarium trade was largely responsible for the decline. The response has been to establish Fish Replenishment Areas in approximately one third of West Hawai’i’s coast waters, closed to reef fish collection. I am glad to report that recent studies indicate that this strategy is evidently proving successful and that closure of these areas to other forms of fishing is likely in the near future. In the December 2001 issue I reviewed the document International Trade in Coral and Coral Reef Species: The role of the United States, a report made by the Trade Subgroup of the International Working Group to the U.S. Coral Reef Task Force. That report stated “International trade in coral, reef fish, live rock and other coral reef animals are activities that contribute to the decline and degradation of reefs, primarily through the use of destructive collection practices and overexploitation of resources.” It also concluded that U.S. aquarists have a particular responsibility because we are the number one consumer of live coral and marine aquarium fishes (as well as the largest importer of coral skeletons and coral jewelry). 1 million U.S aquarists form the bulk of the estimated 1.5 million marine aquarists worldwide. At that time very little information was available on the harvest of invertebrates such as soft corals, anemones, crustaceans and mollusks not covered by CITES and therefore not quantified, with most of these organisms also headed for the U.S. market. The new UNEP World Conservation Monitoring Center document represents a significant improvement in data collection over previous reports and utilizes the best quantitative information currently available from both exporters and importers of marine ornamentals. It also, for the first time, includes information on the organisms other than fishes and stony corals that are part of the trade. The report also is far less shrill in its criticism of aquarists and more realistic about the economic benefits to local communities who provide livestock. This seems due to the efforts of groups like the Marine Aquarium Council to work to eliminate destructive capture techniques such as the use of cyanide and to teach and encourage more benign collection so that the fisheries become sustainable. Their efforts to improve standards for holding and shipping organisms are also becoming apparent in reduced mortality statistics. According to the report current estimates of the number of marine aquarists has been increased to 1.5 to 2 million; the economic value of the trade is estimated at 200-330 million US dollars per year. The summary states “…aquarium animals are the highest value-added product that can be harvested from a coral reef.” The report’s statistics are based on the Global Marine Aquarium Database, newly created through the efforts primarily of the UNEP- WCMC and the Marine Aquarium Council. The numbers are startling. The data, spanning the years 1988-2003, is based on 102,928 trade records covering more than 7.7 million organisms including a total of 2,393 species of fish, corals and invertebrates. It can be accessed at www.unep-wcmc.org/marine/GAD. For fishes, 1,471 species are traded worldwide, “…with the best estimate of annual global trade ranging between 20 and 24 million individuals.” (p. 7). Damselfish, especially the Blue Chromis ( Chromis viridis ) and the Ocellaris Clownfish ( Amphirion ocellaris ), account for nearly half the trade, with angelfish, surgeonfish, gobies and butterflyfish making up the bulk of the remainder. A total of 140 species of stony coral “…with the best estimate of annual global trade ranging between 11 and 12 million pieces.” (p. 8) are traded, primarily from the genera Trachyphyllia, Euphyllia, Goniopora, Acropora, Plerogyra and Catalaphyllia. Sixty-one species of soft coral are traded, about 390,000 pieces, primarily Sarcophyton spp. and Dendronephthya, although the latter is almost impossible to keep alive with present knowledge. The report includes, for the first time with reliable statistics, the trade in invertebrates other than coral. There are more than 500 species traded as marine ornamentals, ranging between 9 and 10 million animals (p. 8), mostly mollusks, shrimps, and anemones, with Lysmata spp. cleaner shrimp and Heteractis spp. anemones the largest single groups. US aquarists account for 80 percent of the trade in corals and 50 percent of the trade in fishes. No marine aquarium fish except for Hippcampus spp. – seahorses – or invertebrates other than corals and clams are listed by CITES as endangered. Economic impact figures are interesting and support the contention of aquarium trade defenders that collection from the reef for the trade is a preferable use of the resource. In 2000, 1 kilogram of aquarium fish from the Maldives was valued at $500 while 1 kilo of food fish was valued at $6. The value of live coral is $7000 per ton while the use of harvested coral for limestone production yields $60 per ton. In Palau, live rock brings $2.2 to $4.4 per pound; when used locally as construction material it brings 2 cents per pound. Estimates indicate that 50,000 people earn their living from the export of marine ornamentals; 7,000 in the Philippines alone. Trade supporters maintain that a properly managed aquarium industry would encourage conservation and sustainable use of reefs while opponents point to over-harvesting, use of destructive collection techniques and high mortality associated with poor handling and shipping. Clearly the objections of critics must be taken seriously. The report also states that only about 1 to 10 percent (about 25 species) of fish are captive bred and less than 1 percent of traded corals are cultured. Efforts to increase the number of species aquacultured must be established as a critical goal. In addition to the greatly improved methods of data collection and analysis compared with previous studies, the report contains important sections covering the organization of the trade as well as conservation issues and ongoing conservation efforts. Each topic includes important recommendations. With respect to the trade’s organization, progress has been made in reduction of destructive collection techniques and increased education about on-board storage and transportation to shore has reduced mortality. Collectors are still poorly paid – an A. percula clownfish brings the collector 10 cents. Analysis of trade data indicates some troubling practices, especially with respect to species with poor histories of aquarium suitability. As mentioned above, Dendronepthya spp. remain among the top ten collected soft corals, with the US as the largest importer. The bluestreak and Hawaiian cleaner wrasses Labroides dimidatus and L. phtirophagus, the mandarin fish Synchiropus splendidus, as well as the foureye butterflyfish Chaetodon capistratus and harlequin filefish Oxymonacanthus longisrotris continue to be collected in spite of their low aquarium suitability. In general, lack of understanding of the population status and life history characteristics of traded species makes it difficult to establish realistic standards for sustainability and the need for such research is highlighted – but for species with consistently poor aquarium survivability, regulation should be established. Conservation issues primarily concern the impact of aquarium collection on local target organism populations. The Hawai’i’s State of the Reefs Report reviewed in the August 1999 remains the only systematic study of collection impacts on fish populations. An analysis from the Maldives indicated that collection of anemones and their anemonefish significantly reduced populations of these species at exploited sites and that the low abundance of sea anemones accounted for 80 percent of the reduced density of anemonefish in collection areas. Studies of population densities of the Banggi cardinalfish indicate reduced densities and halved group size in areas with high aquarium collection and the species has been proposed for listing as “critically endangered.” For this easily aquacultured mouth-brooder there is no longer justification for taking wild specimens. There is virtually no information on the impact of coral collection and very little on the life history characteristics, natural growth rates or reproductive success of most coral genera traded. It is clear however that “practices such as coral mining for the production of lime rock (for construction) have a much more significant impact on the alteration of coral populations and community structure than the collection of corals for the ornamental trade.” (p. 38). 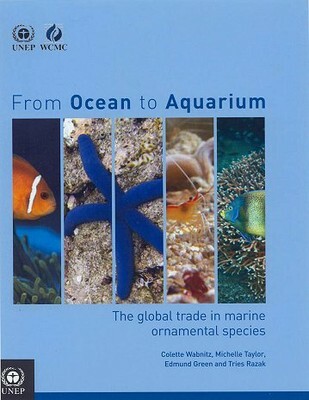 The section concludes with a listing of the most commonly captured and traded fish species and their aquarium suitability, based primarily on Scott Michael’s index, found in his invaluable book, Marine Fishes; 500+ Essential To Know Aquarium Species (reviewed in Aquarium Frontiers, Nov. 1999). As I wrote in that review, don’t even go near your local fish store without a copy of this book so that you can check on the needs of the fish you eye. Conservation efforts focus first on the Marine Aquarium Council’s Core Standards, covering the “reef to retail” chain. The standards address fisheries management, the processes of collection, fishing and holding as well as handling and holding of organisms in transport. In addition, the report emphasizes the expansion of mariculture for fishes, corals and soft coral and for other invertebrates traded, with special emphasis on the captive breeding of seahorses. The report specifically recommends limited access to fisheries through licensing systems, establishment of quotas, maximum and minimum (“slot”) size limits and the establishment of reserves. The report concludes with an extensive, 237 item bibliography. This report is a great step forward in our knowledge of the realities of the marine ornamental trade. It’s very much worth downloading and reading this concise overview of a global trade we must take responsibility for, if we are to continue to enjoy our aquariums with clear conscience.